Synopsis: A spoiled heiress, running away from her family, is helped by a man who’s actually a reporter looking for a story. Warne is a maverick reporter, the bane of his long-suffering editor’s life. When we first meet him, he’s drunkenly holding an exchange over a bus station telephone with his boss which results in his being fired. Also at the station is Ellie Andrews, an heiress on the run from her over-protective father. Ellie is intent on returning to New York where the new husband, of which her father disapproves, is waiting for her. Both Warne and Ellie board a bus to New York, and it’s not long before they lock horns. However, when Warne realises who Ellie is, he knows he has a scoop on his hands and determines to accompany her on the entire journey. It Happened One Night was the movie that elevated Columbia Studios from Poverty Row to Hollywood’s elite. It won five major Oscars, and yet the two leads were both reluctant to appear in it. It’s difficult to understand exactly why they disliked the project so much, because it’s a movie filled with smart dialogue and comical situations. Perhaps it was working for Harry Cohn to which they objected. Columbia’s chief was a crude, boorish man, who gained some kind of perverse pleasure out of his reputation as the most hated man in Hollywood. Whatever his failings, Cohn was a shrewd businessman: he secured the services of Frank Capra, the director of It Happened One Night, for a bargain price and fully understood that the future of his studio pretty much rested on Capra’s shoulders. 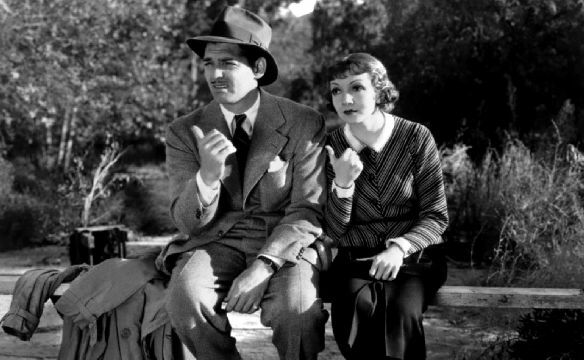 While the storyline of It Happened One Night is pretty daft – a hyperactive tale in which the flight of a spoiled heiress results in front page national headlines – the humour is still remarkably fresh, and is enlivened by an energetic performance from Gable, for whom this proved to be a breakthrough performance. He’s more brash and cocky here than he would be in later movies, but the contrast of this brashness with Colbert’s more refined heroine works well. Both their characters are free spirits who rebel against authority figures, and there’s never any doubt about the outcome of the movie, but that doesn’t prevent It Happened One Night from being an enjoyable ride.